This blog demonstrates an example of how implementing organisational changes within your business, such as ‘job rotation’ can help reduce the vibration dose, or the Daily Vibration Exposure A(8), experienced by staff who use power tools. It describes the use of the online HSE ‘Ready Reckoner’ points system which is simpler to use than mathematical equations. It’s highly likely that such organisational changes will reduce the risk of contracting Hand Arm Vibration Syndrome (HAVS). The example described is one that could be encountered in real life. reducing the vibration levels of the operating tool or equipment. reducing exposure times (e.g. by ‘job rotation’). Elimination of the risk [option a] is most desirable because it leads to zero exposure. You could ask yourself if the process needs to be done at all. If so then can be it be automated, or at least be substituted by a much less harmful vibration emission process (e.g. welding instead of riveting). If none of these options are possible, then you may look to replacing the current tool by one that emits lower vibration levels [option b]. If item b) is also judged to be a ‘non-starter’, then the next point to consider would be decreasing the exposure time of the employee when carrying out the task [option c]. This may be achieved by sharing the task between employees, by ‘job rotation’. An example of how this would apply is shown in the section below. 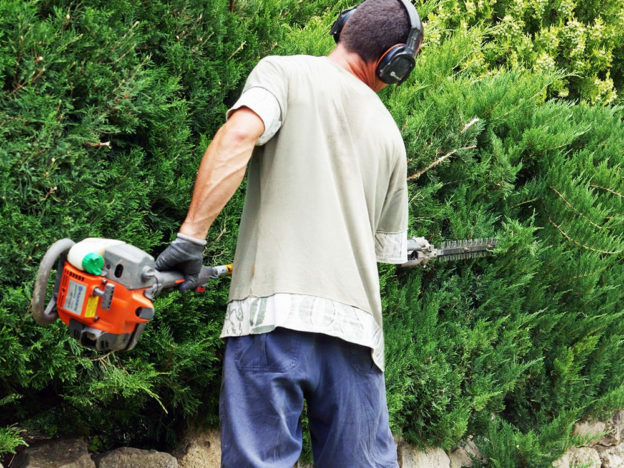 In a typical landscape gardening business, there are four members of staff each carrying out a separate task using a hedge trimmer, a chain saw, a brush saw, and a mower. Vibration magnitudes of these various tools were measured (in accordance with BS EN ISO 5349) and the daily use durations (i.e. the ‘trigger’ times) for each tool use were extracted from a hand arm vibration record sheet filled by the staff. The A(8) value could then be established. The HSE online exposure calculator in the form of an Excel spreadsheet is available on http://www.hse.gov.uk/vibration/hav/vibrationcalc.htm and is used to calculate A(8) in terms of exposure points for each member of staff carrying out their task using a particular tool. A snapshot of the ‘Hand Arm Vibration Calculator’ spreadsheet is shown in Table 1 below, and for each tool vibration data and exposure durations (i.e. daily use) have been entered (white cells). The figures in the yellow cells are the automatically evaluated exposure points and the darkened cells are to be disregarded. It can be seen that the employee who uses the Chain Saw daily, exceeds the Exposure Limit Value (ELV) (with 613 exposure points), whilst those employees using the Hedge Trimmer and Brush Saw exceed the Exposure Action Value (EAV) (with 225 and 305 exposure points respectively). The operative using the Mower is subjected to less than the EAV. According to the Regulations, when the ELV is exceeded, then steps shall be taken to reduce A(8) to below the ELV. To ensure that no operator is exposed to vibration exceeding the ELV, and to reduce the greatest A(8) values, a solution could be to share the four tool operations equally between the four operators (i.e. 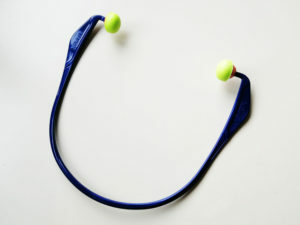 each operator shall use two tools) by way of a ‘job rotation’ process. Any operator shall use a tool for only half the daily use or exposure duration which arithmetically equates to halving the exposure points. An amended calculation in Table 2 below shows how the exposure points have been reduced by half when halving the exposure duration per tool. Preference should be given to the Chainsaw/Mower and Hedge Trimmer/Brush Saw combinations since these are slightly lower than any other combinations. In other words, the Mower operator should swap roles with the Chainsaw operator when half the exposure durations have been reached for both tools. The same principle will apply regarding the Hedge Trimmer and Brush Saw combination. None of the operators will now be subjected to vibration above the ELV. A good risk assessment should take into consideration the possibility of recommending organisational changes such as ‘job rotation’ as part of the hierarchy of vibration control. To find out what constitutes a good, or suitable and sufficient risk assessment, Essel Acoustics has a downloadable free guide explaining this. Click here to download your free copy.